Thomas Piketty’s visit to South Africa provides an opportunity to think creatively about what is driving inequality in the country and what appropriate measures might be to address the problem. South Africa has unacceptably high levels of inequality, and is routinely described as among the most unequal in the world. Piketty will be delivering the 13th Nelson Mandela Annual lecture in early October. His magisterial and masterful study of inequality is published in his book Capital in the Twenty-first Century. The book, built on many years of careful research, quickly became a bestseller and he has achieved the status of something of a ‘rock star’ in the economics profession. Some have gone as far as to hail him a modern Karl Marx. Piketty had been thinking about the extreme high levels of inequality in South Africa. He begins his first chapter using the example of the tragic events at Marikana in 2012. The point he illustrates is that what share of output should go to wages and what share to the owners of capital has been at the heart of distributional conflicts in capitalist systems. Besides providing an impetus to read his book, I have heard it being compared to the bible: everyone has it but very few people have actually read it. Piketty’s book has two central messages. First, that we should be cautious of economic determinism in debates about inequalities in the distribution of income and wealth. He argues that, rather than just economic factors, it is political factors that have driven patterns of inequality. The reduction in inequality in much of the developed countries in the interwar and immediately post Second World War period was the result of deeply political forces and choices. Similarly, the rising levels of inequality after the 1980s is driven by political shifts, especially with regard to taxation and finance. 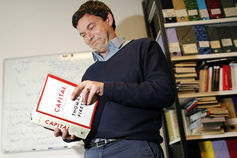 Second, and more important for South Africa’s purposes, Piketty cautions that left to its own devices, the economy is likely to generate forces driving toward inegalitarian and highly destabilising outcomes. His research shows that there are no natural conditions pushing the economy away from the normal pattern where the returns to invested capital tend to be higher than the rate of economic growth. This increases levels of inequality. Only two factors – a rapid burst in economic growth and government intervention – can be relied on to shift the economy away from this ‘normal’ pattern of development. So, what does this all mean for South Africa? There is a lot that one can say about the relevance of Piketty’s work for the country. Let me venture three thoughts. First, the importance of government as a counterforce to the normal pattern of economic development in inequality. In the South African debate, at least outside the academic world, there has not been sufficient acknowledgement of the importance of government’s role. For all its weaknesses, it has played a pivotal part in redistributing income and stabilising South African society. One estimate shows that South Africa’s Gini coefficient, which measures levels of inequality for income before social transfers, is 0.69. For income after social transfers it is 0.52 and for income after taxation it is 0.47. A figure of 0 is considered perfect levels of equality and 1 perfect inequality. The democractic government introduced a massive social grant system which now distributes R155 billion to 16 million South Africans. Can you imagine what South African society would have looked like without government intervention? Second, the largest contributor to inequality in South Africa is incomes in the labour market. One estimate shows that labour market incomes contribute 88% of the overall gini coefficient in South Africa. There are of course two dimensions to this - the high levels of unemployment in South Africa and the high levels of wage inequality among the employed. Clearly, the labour market should be the focus of any strategy to address inequality in South Africa. Third, and related, the debate on inequality in South Africa has focused almost exclusively on economic considerations - what Piketty calls economic determinism. We need to think a lot more about the political forces shaping the current patterns of inequality in South Africa and what political configurations are needed to ensure that the economy shifts along a path that generates more employment and income opportunities for a wider spectrum of our society. In other words, the question the country needs to answer is: what political forces are needed to generate more equality in the opportunities available to South Africans?